A model from Canada is warning people to “think twice” about a body modification practice quickly growing in popularity after “losing sight” in her right eye. Calling the decision a “massive mistake,” Gallinger shared the horrifying results of the procedure on social media, according to The Sun. 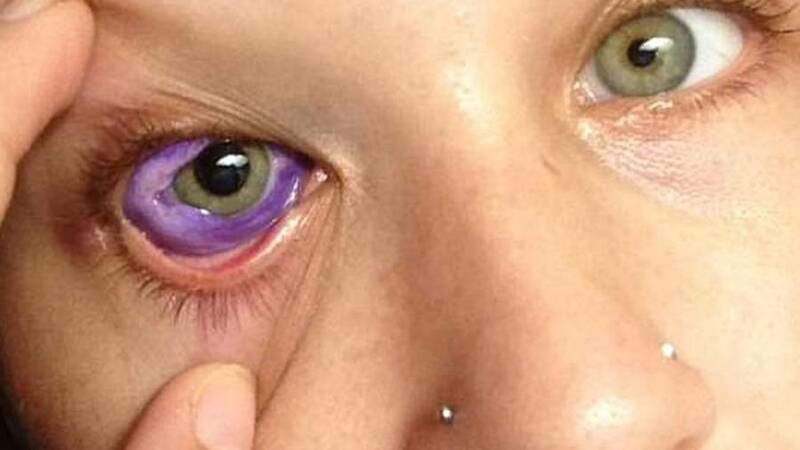 The images, posted to her Facebook wall, shows the 24-year-old former pet nutritionist in various stages of recovery following a visit to the hospital last month when she complained of purple discharge oozing from her eye. Canadian model Catt Gallinger, 24, inked with a sclera tattoo, a body modification procedure that colors the whites of the eye, last month in Ottawa. Medical professionals administered antibiotics drops to the affected area and sent Gallinger home. But shortly after receiving the treatment, her eye became swollen shut. 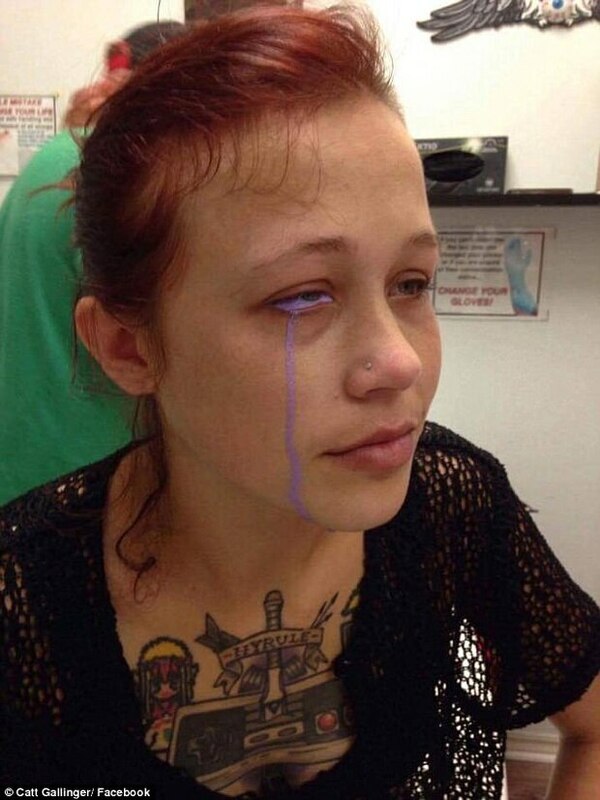 Doctors then gave Gallinger steroid drops to alleviate her symptoms, but after three weeks the purple tattoo began to congeal around her cornea, blurring her vision and causing intense discomfort. Gallinger told The Sun newspaper that she has had to spend hundreds of dollars on prescriptions so far and says that her modeling career is on hold for the time being. Asked why she wanted a sclera tattoo to begin with, Gallinger said the modification would help “make me feel more at home in my body”. She is hopeful, however, that surgery will prevent her condition from getting worse. Doctors believe that the size of the needle, depth and amount of ink used on Gallenger caused the initial symptom. They fear that an infection is stuck in the excess ink, which contaminated Gallenger’s eye through equipment not properly sterilized. Gallinger began posting public Facebook updates about her eye on Sept. 20 to warn others against the procedure. By then, she said, she had visited the hospital several times and had been prescribed a slew of antibiotic and steroidal eye drops to reduce inflammation. Her vision in that eye had blurred and showed no signs of improving, she added. “There are multiple people who can attest that my aftercare was good and any other part of what I am saying,” Gallinger wrote. “The procedure was done by someone who told me that they were experienced,” Gallinger said in a subsequent video. “She already has about 25 tattoos on her body, and has undergone another risky procedure to split her tongue to make it appear forked. So Gallinger said getting a sclera tattoo seemed like the next step. . . . But Gallinger hadn’t done enough research and gave in too soon to pressure from her boyfriend, she said. 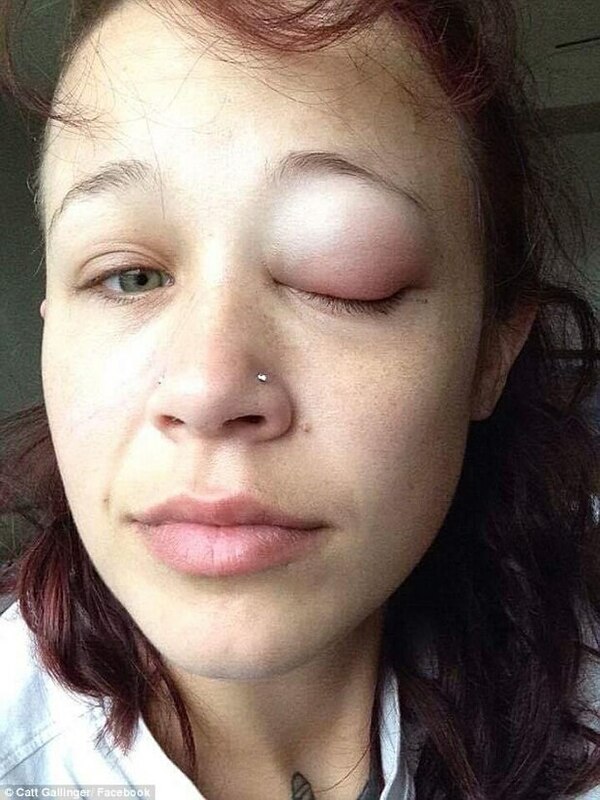 Doctors initially treated the condition by administering antibiotic drops to the affected area, causing massive swelling. Body modification procedures, sometimes referred to as “body mods,” include anything that changes one’s anatomy or appearance, from piercings to breast implants to foot binding. Body tattoos and ear piercings are perhaps the most common forms of body modification, but in recent years, more extreme procedures – such as tongue splitting and, yes, eyeball tattooing – have taken hold. The American Academy of Ophthalmology strongly recommends against sclera tattooing, noting risks such as blindness or worse. “I personally have not trained anyone else to do this procedure. I have appeared on various tv/news segments though, and have inspired many copycats worldwide,” he wrote. On Facebook, Gallinger said she had been in contact with Luna Cobra since her ordeal – and, though she said she respected him, added she had no plans to undergo the procedure ever again. “Just please be cautious who you get your mods from and do your research,” Gallinger wrote.